The holidays are here again, and there’s nothing like the sound of Christmas music to boost your spirits. The Elmhurst Choral Union and Orchestra presents a wonderful evening of entertainment, The Many Moods of Christmas, on Sunday, Dec. 3 at Elmhurst College’s Hammerschmidt Memorial Chapel. All of us at Elmhurst Toyota hope you can attend this concert of festive seasonal music. Elmhurst Choral Union is an auditioned chorus that performs with a full professional orchestra. Led by conductor Scott Uddenberg, the ensemble will perform legendary choral composer Robert Shaw’s “The Many Moods of Christmas,” which includes many well-known holiday favorites set in a group of four suites. Among the songs you’ll enjoy are “Silent Night,” “Oh Come All Ye Faithful,” “Joy to the World,” “Away in a Manger,” “Hark! The Herald Angels Sing,” “Oh Little Town of Bethlehem” and more classic choral titles. Other featured music included in The Many Moods of Christmas concert are John Rutter’s setting of “Gloria,” sung in the original Latin, as well as Ken Darby’s arrangement of “Twas the Night Before Christmas.” From sacred music to secular, there’s something in this concert for everyone to enjoy. The Elmhurst Choral Union began as an ensemble of Elmhurst College faculty and students. In 1961, the group grew when it merged with a local choir made up of community members. 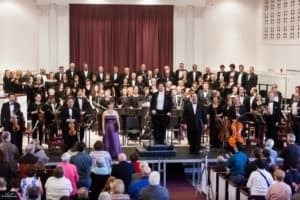 The Elmhurst Choral Union’s repertoire includes classical standards and recent compositions, as well as some rare works by various composers. Scott Uddenberg is the group’s fifth conductor. Everyone is invited to attend this wonderful selection of holiday music performed joyously by a group of talented singers and musicians. Hammerschmidt Memorial Chapel provides a beautiful setting for the concert and boasts wonderful acoustics, thanks in part to its soaring, cathedral ceilings. Sunday Dec. 3, 2017, 3-4:30 p.m.
Visit elmhurstchoralunion.org, email info@elmhurstchoralunion.org or call (800) 838-3006.